I don't know about you, but one thing I love about fall are the desserts! Something about them are so yummy and comforting during those chilly days. Here is one fall dessert that is sure to be a hit at home or at a holiday gathering this year. Just don't eat the whole pan before everyone else gets to try a piece! -Preheat your oven to 350F. -In a mixing bowl combine 1/2 cup butter with 1/2 cup sugar until it is nice and whipped. -Add 1 egg and the vanilla extract continuing to mix well. -Add 1 cup of flour and baking soda, mix that all up well too! -Spread your concoction in your baking dish that you had set aside. -Bake in the oven for 8 minutes, leave your oven on yet remove the baking pan after those 8 minutes. -In a small saucepan you will make your filling by combining your 7 oz caramels and 1/4 cup evaporated milk. You want this to all melt together as you stir continuously. -Pour your caramel goodness over the crust in your baking pan and add your pinch of sea salt. -To create your top layer of your blondie goodness, place 1/4 cup butter, 1/4 cup sugar, 1 egg and 1/2 cup flour in your food processor and pulse it. -These crumbles go over the caramel you blanketed your crust in. -Pan goes back in the oven for 20 minutes. 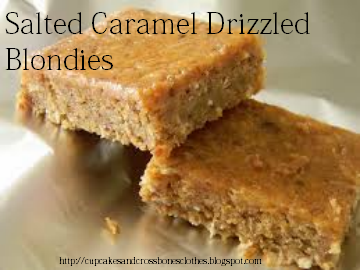 -Let your blondies cool, and before serving add an extra drizzle of caramel sauce. Yum!! Are you more of a blondie or a brownie fan? What is your favorite fall dessert? I feel like my husband would love these. Maybe I'll make them as a welcome home present when he gets back ina month! Yes! Let me know what you guys think. They are delicious! haha yes! Let me know what you think! Those look delicious. I can't remember the last time I had a blondie but really should make some! I hadn't have one in forever and then I made these...I'll never go that long again! These sound so delicious! I love how festive they are for fall without being pumpkin flavored, haha. Can you tell I'm not a fan of pumpkin? Holy cow, how freaking delish!! I must make these asap! Thank you for sharing! !